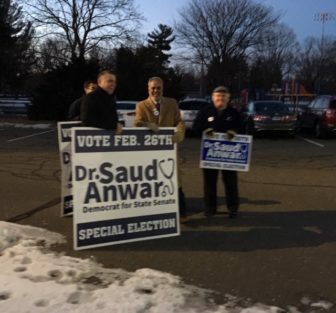 M. Saud Anwar, center, poll standing in the cold Tuesday night in East Hartford. He won with 59 percent of the vote in the 3rd Senate District. Republicans won two of the five state legislative seats at stake in special elections Tuesday, flipping House and Senate districts by carrying blue-collar communities that have grown difficult for Democrats. All five vacancies were the result of Gov. Ned Lamont hiring Democratic legislators in January. Even with the losses, Democrats retained solid majorities of 91-60 in the House and 22-14 in the Senate. But Republicans got a morale boost after losing ground in the General Assembly last fall for the first time in 10 years. In the night’s biggest upset, Republican Gennaro Bizzarro of New Britain won the the 6th Senate District with 53 percent of the vote, defeating Rep. Rick Lopes, D-New Britain. The district includes the GOP-trending suburb of Berlin, where House Speaker Joseph Aresimowicz, a Democrat, barely won re-election last fall against a late entrant in the race. Lopes carried New Britain by about 500 votes, but lost Berlin by nearly 1,000 votes. The district also has a piece of Farmington that was carried by Bizzarro. Two Democrats held onto Senate seats in solid Democratic districts: M. Saud Anwar of South Windsor, a physician who became the state’s first Muslim mayor in 2013, won the 3rd Senate District with 59 percent of the vote over Republican Sarah A. Muska; and Rep. Derek Slap of West Hartford won a four-way race in the 5th Senate District with 63 percent. Republican Bill Wadsworth finished second with 34 percent. In the 39th House District of New London, Democrat Anthony L. Nolan won a four-way race with 51 percent. The runner-up, Mirna Martinez of the Green Party, had 29 percent. Republican Joseph Zullo of East Haven won in the 99th House District, which was carried by Donald J.Trump in 2016, a harbinger of difficult times to come for the Democrats in a district they’ve dominated for three decades. With 54 percent of the vote in a two-way race, Zullo easily defeated Democrat Josh Balter, who was cross-endorsed by the union-backed Working Families Party. The only other candidate the WFP cross-endorsed was Lopes. Republicans tried to use Lamont’s recent endorsement of electronic tolling for all motor vehicles — a reversal of his trucks-only stance during the campaign — as a catalyst to mobilize Republicans, independents and disaffected Democrats. “We did use tolls very effectively in the 6th Senatorial,” said J.R. Romano, the Republican state chairman. Eight years ago, the GOP failed to convert a major tax increase proposed by Gov. Dannel P. Malloy on the eve of nine special elections for legislative vacancies. Democrats won seven, losing in two competitive districts. Nancy Wyman, the Democratic state chair, said special elections waged in the cold as a six-week sprint do not lend themselves to broad analysis. A strong personality, combined with a good organization, can lead to upsets, she said. “We knew East Haven was going to be a difficult race,” said House Majority Leader Matt Ritter, D-Hartford. The 2018 election showed signs of a realignment in Connecticut, with Democrats carrying college-educated, relatively affluent communities that had long gone Republican. Conversely, even as they lost seats, the GOP showed continued strength in ethnic, blue-collar communities that once were solidly Democratic. U.S. Rep. Jahana Hayes, a Democrat who became the first black woman elected to Congress from Connecticut last year, briefly became an issue in the 6th Senate District, where the Republican used B-roll video of the popular congresswoman without her permission. Hayes objected to any suggestion she was endorsing Wadsworth, but she never endorsed Lopes. The five Democratic legislators who resigned to join the administration were former Sens. Timothy Larson of East Hartford, Beth Bye of West Hartford and Terry Gerratana of New Britain and former Reps. Chris Soto of New London and James Albis of East Haven. Slap, who succeeds Bye, will now resign his House seat, at least temporarily dropping the House Democratic majority to 90. A special election in the safe Democratic districts most likely will be held in April.